Bomber Command Association in Australia Inc.
Red Cross Concert The Australian Red Cross celebrates 100 years! 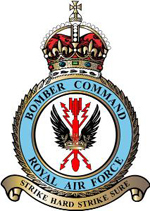 The Bomber Command Association is very pleased to be associated with the concert and it will be an ancillary event on the Bomber Command Commemorative Day Week-end in Canberra which is being held over the weekend of 31 May – 1 June 2014. Friday 30 May 2014, 8.30pm. Bookings to the Canberra Southern Cross Club on 6283 7288.